Each fall I always look forward to the annual ILF (Indiana Library Federation) conference. Indiana is unique in that we have one main conference for all types of librarians librarians with various strands of presentations/topics sponsored by our associations within ILF that suit different types of librarians whether they work in academic, public, school, or special settings. This year's conference theme #ANewPageILF14 as well as a new location on the east side of Indianapolis combined together for a great two days of connecting and learning on November 18-19. All conference experiences for me boil down to 4 main parts: sessions, exhibit hall, networking, and friends (obviously NOT in order of importance!) and this conference rated high in all 4 for me! 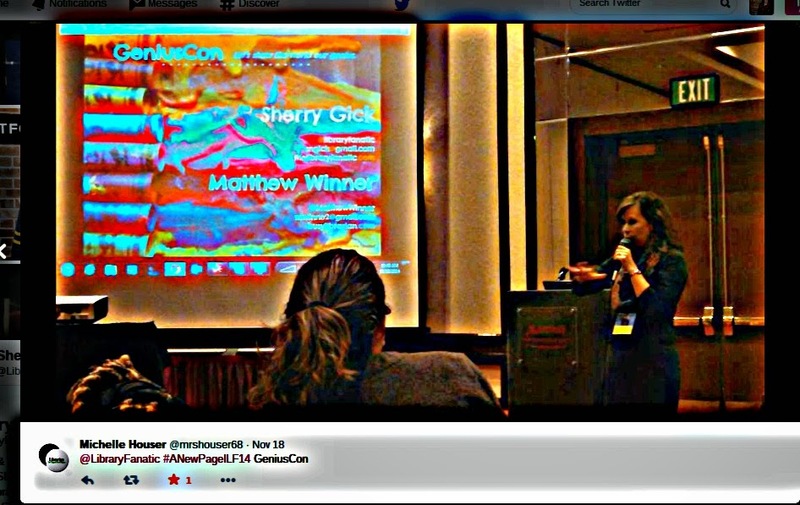 On Tuesday I shared about GeniusCon (which I've never presented without Matthew Winner)! Having supportive friends in the audience including Lindsey Hill from Evanced Solutions who came just to hear me present made this session super special for me. Later that afternoon I presented with my Indiana Library Leadership Academy PASS it on! team members about INSPIRE to a packed room! Joe Fox, Julie Elmore, Vincci Kwong, & me! 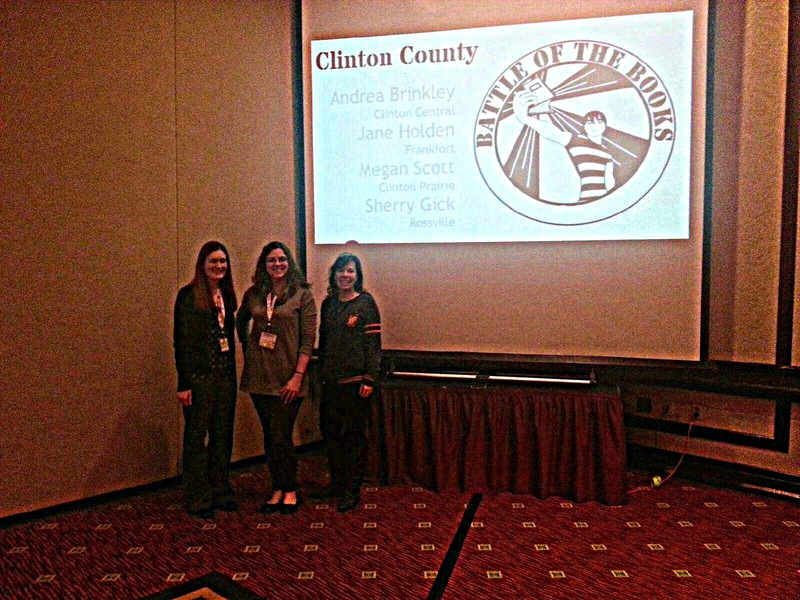 On Wednesday, the morning began with my favorite presentation on our Battle of the Books program in Clinton County with fellow school librarians Andrea Brinkley and Megan Scott. 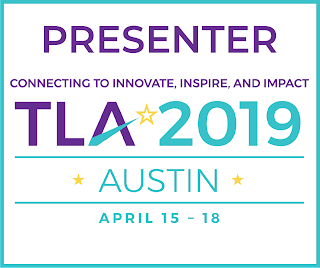 I also had the opportunity to attend several quality sessions (Thanks Lena Darnay and Chad Heck) that gave me ideas for my school library. Exhibit Hall: ILF scheduled non-interrupted time (i.e. not during sessions) to visit the exhibit hall but that time was way too crowded and overwhelming for me. On Wednesday, we visited the hall during the keynote (sorry! it just wasn't working for me...) and had the opportunity to talk to several vendors about redesigning library spaces, get Chris Van Allsburg's autograph (squee!) and of course, see my friend Keith at Cover One! Networking: I always appreciate ILF because I get to see all kinds of librarians from all over the state as well as others involved in the library world. These type of opportunities are so important as many of us are alone in our buildings. Time to talk and share ideas is beneficial and priceless to me. Our AISLE board meeting(s) also brought about time to make new connections and take on new responsibilities. Friends: My absolute favorite part about ILF this year was time to share and connect with friends. These are the people who "get" me. I thoroughly enjoyed spending extended quality time with Kathy Burnette, Lindsey Hill, Megan Scott, and Andrea Brinkley. Thanks ladies for making ILF so wonderful! Great job ILF Conference planners -- looking forward to being on the team for planning IlF 2015!